As I pointed out in yesterdays weekly results post; today I am adding another free tipster to the ever increasing stable that is my Portfolio Lite. 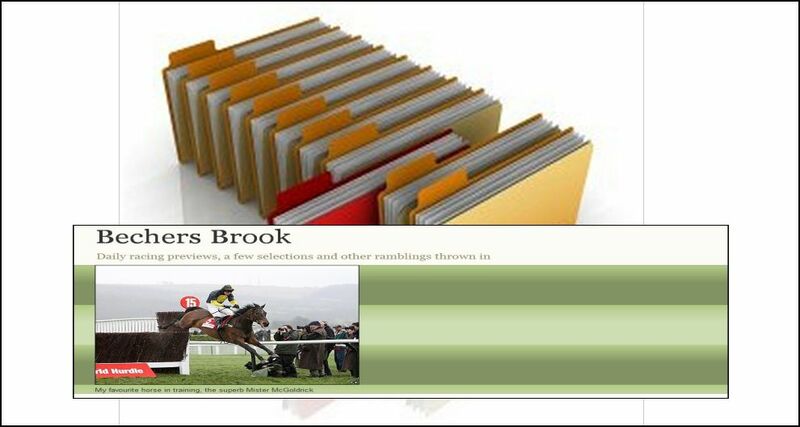 The tipster that I am adding today is the great Bechers Brook blog. For any readers who are not aware of the blog, the tips and the advice given on there by Robert the blogs author I would advise you to read my Blog Post Of The Week for this week to get a flavour of the quality of his work. "Welcome to my blog. I'll be posting daily racing previews, the odd other sports bet, and "Notebook Horses". These are horses that for one reason or another I have picked out that should be worth following in the near future. They will not be horses that have romped home on their latest start!!!!" That first post was only written less than two months ago and since then the running total profits from backing his selections as of this morning were: 170.65 points!!!! Robert uses a variable staking plan up to a maximum stake of 5 points. 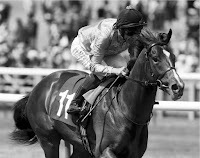 Although I have only been monitoring his selections for a while it is already obvious to me from the quality of his results and also from the quality of his detailed write ups that his selections will continue to be extremely profitable over the long term. Robert's selections also tend to be at longer odds than the rest of my portfolio lite's tipsters, which will reduce the risk of high liabilities due to the same selection being made by more than one tipster in the same race. I have started to follow the selections from today and my initial staking will be using the same twist on eachway staking that I use for the The Market Examiner Service. To get an explanation of how that works click HERE. The actual size of my stakes will be linked to those used on the Bechers Brook blog in that a one point bet on the blog will be equal to £1 eachway bet for me and a 2 point bet will equal to a £2 eachway bet for me. I will set up a bank of £400 and £1 eachway (£2 total) will equal one point. If my bank doubles I will double my stakes if my bank halves I will halve my stakes. I suppose it made up for when my eachway selection Grandouet was brought down when in my opinion it was looking like it was probably going on to win. I've not worked out the total profit for the day but it will definitely be a big positive for the portfolio.